I’ve played and enjoyed a lot of role playing games over the years, but one genre I could never quite get into was the first-person dungeon crawler. Typically very non-linear and lacking the conveniences of modern-day RPGs in terms of tutorials and guidance, new dungeon crawlers always felt like titles that only appealed to gamers that were already fans. 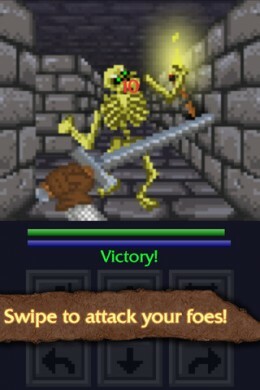 However, QuestLord (Free) doesn’t elicit that feeling of being immediately overwhelmed that I seem to encounter with other dungeon crawlers. In fact, I’d argue that QuestLord’s simplicity in both scope and gameplay, while probably a turnoff to genre veterans, makes it a great title for folks looking to get into the mix. If you’ve never played a dungeon crawler, QuestLord is a first-person turn-based RPG with an emphasis on exploration. Players initially make a character by choosing from one of three races, each with different stats. In addition, depending on your selection, you’re placed in a different location within the world to start. Regardless of where you start, you’re immediately given the role of QuestLord and told to travel the world providing assistance to the populace of the Shattered Realm. As you might imagine, a large portion of QuestLord’s content centers around the various quests assigned by the NPCs. From the first task given, the quests do a good job of encouraging exploration and placing players near other quest givers as well as providing ample award for completion. However, the actual objectives definitely lack variety and mainly revolve around killing certain enemies once you reach a location. I also wdould have liked more in terms of story narration and scope as QuestLord’s writing is somewhat weak. Based on the above, you’d think QuestLord wouldn’t have much to offer but that’s not really the case. The game’s emphasis on simplicity goes a long way towards making what it does offer approachable. Stats are divided into three attributes which boil down to attack, defense, and spell points and can be increased with each level-up. Meanwhile, the spell system is based on discovering new spells in the world, a nice incentive to explore every map. 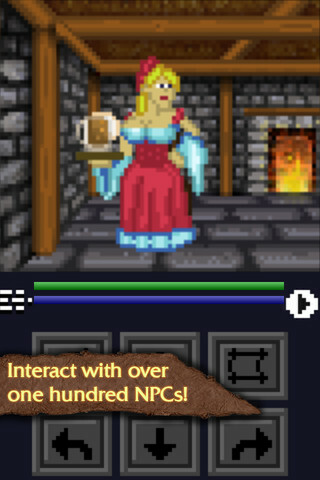 In addition, QuestLord also features a robust item system, with plenty of slots and equipment to find. I also appreciated the game’s auto-map feature which not only shows the player’s location in the world, but also within each individual map (some magical items will even instantly reveal said maps for you if for some reason you don’t want to explore). This all leads to a game that’s very manageable in terms of quests, world-size and objectives. Without having to worry about some of the traditionally more complicated pieces of dungeon crawlers, I found it enjoyable to simply explore the world and see what I could discover. It sounds like a small thing, but I think this, combined with the relatively easy difficulty went a long way towards making QuestLord approachable. While it seems to be a calling card for the genre, one area that I really didn’t enjoy was QuestLord’s visual style. While I do realize that old-school graphics are part of the charm with most dungeon crawlers, the visuals in QuestLord are a little too classic, with retro graphics that are highly pixelated and a menu/item system and control buttons that just don’t look too good. Does it detract much from the experience? Probably not, but it’s still something that needs to be mentioned. Still, I give QuestLord a lot of credit for properly introducing me to a genre that I never really could get into. 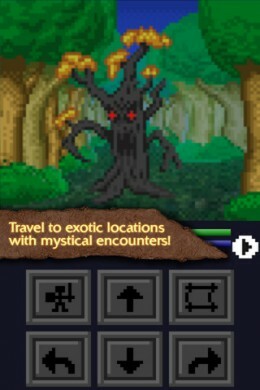 With a streamlined attribute and quest system, there’s not a lot of depth that is traditionally found in other titles. However, it’s for this exact reason that I think it succeeds for newbies like me. 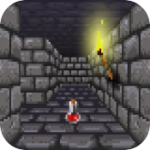 Assuming you’re looking to give dungeon crawlers a try, I’d definitely recommend QuestLord as an introductory taste.